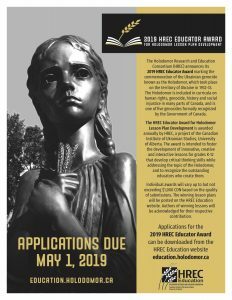 The Holodomor Research and Education Consortium (HREC) announces its 2019 HREC Educator Award marking the commemoration of the Ukrainian genocide known as the Holodomor, which took place on the territory of Ukraine in 1932-33. To be the voice of the Ukrainian community regarding Holodomor education before the Ukrainian community, government officials, school boards, and educational institutions, such as the Canadian Museum of Human Rights. Since 2009, the NHEC is the coordinating body for Holodomor education on behalf of the UCC with representation from the provinces of Alberta, Saskatchewan, Manitoba, Ontario, and Quebec and British Columbia. To include the topic of the Holodomor in provincial school curricula across Canada. To promote and support the teaching of the Holodomor in schools across Canada. To set up a day of remembrance, the Holodomor Memorial Day, in schools across Canada on the fourth Friday in November. To provide, on an annual basis, a reminder and information for conducting Holodomor Memorial Day at the school level. To conduct professional workshops for educators throughout Canada on teaching the Holodomor at Professional Development Days, Professional associations. This is crucial as Canadian educators need to know that expertise and methodologies to teach the Holodomor are provided by professional. To present a consistent approach to the information provided to schools and educational institutions on the Holodomor, including the interpretation and basic concepts surrounding the topic of the Holodomor. To identify professional educators at the elementary and high school levels teaching history and social studies in each province, in order to share resources and promote the teaching of the Holodomor. To identify areas of curricula in each province in which the Holodomor is taught or may be taught, and share this information with educators. To share and distribute professional teaching materials and resources on the Holodomor to ministries of education, school districts or school boards across Canada. To represent the UCC and along with local representatives to visit ministry of education staff regarding the teaching of the Holodomor in each province, especially during periods of curricula review, providing expertise on its teaching and sharing resources on teaching the Holodomor. To share expertise with educational institutions, school boards, and ministry of education staff, regarding curricula and learning resources on the Holodomor (e.g. Canadian Museum of Human Rights, faculties of education). To share expertise with community groups regarding curricula, methodology, and learning resources on the Holodomor. To support and provide expertise on the development of new teaching materials on the Holodomor. To support and share the Holodomor Students’ Competition in all provinces in Canada. To present train-the-trainer workshops to prepare presenters to conduct classes on the Holodomor to students in Canada. 1. To create a National Holodomor/Ukrainian Genocide Education Committee (NHEC) with representation from all regions of Canada and co-ordinate the work of including the topic of the Holodomor into the regular school curriculum in each province. 2. To present a consistent approach to the Holodomor/Ukrainian Genocide and it’s teaching across the country. To set up a subcommittee in each area/province that will carry out the work on the teaching and commemoration of the Holodomor/Ukrainian Genocide. It will identify professional educators at the elementary and high school levels, who are knowledgeable in the social studies and history curriculum of their province. 3. To provide human and technical expertise to the subcommittees on the Holodomor/Ukrainian Genocide for educational institutions, school boards and ministries of education, and facilitate in the preparation of presentations to the above. 4. To develop, share and distribute teaching materials and resources on the Holodomor/Ukrainian Genocide. 5. To set up the Canadian Centre for Holodomor/Ukrainian Genocide Study and Education within the confines of the Ukrainian Canadian Research and Documentation Centre, as the centre in Canada for information on teaching the Ukrainian Genocide, for distribution and publication of resource materials for teaching the Holodomor, and provide In-Service Teacher Training on the Ukrainian Genocide for educators across the country. Schools in the catholic school boards have a daily prayer. Some have opted for a special prayer along with the announcement about the Holodomor on Holodomor Memorial Day. Remember, O Lord our God, our reposed brothers and sisters who, with faith and hope in eternal life, perished in the Holodomor (Great Famine), whose names are know to You, O Lord. As our merciful God and Lover of Mankind remit, pardon, and forgive all their sins, both voluntary and involuntary, and grant them Your eternal good things which have been prepared for those who love You. Be merciful unto them, and accept their faith instead of their works, and grant them rest, O Compassionate One, with the saints. For there is no man who has lived without sinning, You only are without any sin, and Your righteousness is eternal. For You are a God of mercy and compassion and love for mankind, and we offer glory unto You, to the Father, and to the Son, and to the Holy Spirit, now, and ever, and unto the ages of ages. Amen. Помяни Господи, Боже Наш, у вірі й надії на життя вічне спочилих рабів Твоїх, всіх братів та сестер наших голодом замучених, яких імена Ти сам, Господи знаєш, і як Милосердний і Чоловіколюбний, полегши, даруй і прости всі провини їх, вільні й невільні, і дай їм вічні Твої блага, наготовані для тих, що люблять Тебе. 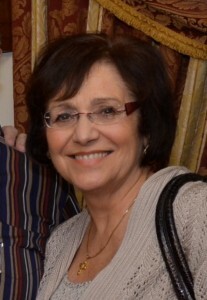 Valentina Kuryliw is the Chair of the National Holodomor Education Committee of the Ukrainian Canadian Congress and the Director of Education at the Holodomor Research and Education Consortium in Toronto, affiliated with the University of Alberta. A retired teacher, a history specialist, and former department head of history and social studies for the Toronto District School Board, she has over 35 years of teaching experience. She developed and taught additional qualification courses for history teachers in Ukraine for sixteen summers, emphasizing critical and historical thinking skills, and the use of interactive methods. She spearheaded efforts to include the teaching of the Ukrainian genocide into school curricula across Canada and Ontario in particular. She authored two books: one for Ukraine, titled Metodyka vykladannya istorii (2003 and 2008) on teaching methodologies in history; the other for North America, titled “Holodomor in Ukraine, the Genocidal Famine 1932-1933, Learning Activities for Teachers and Students.” Valentina’s latest project was the creation of the lesson “The Historian’s Craft” for the Holodomor Mobile Classroom travelling RV, and a project of the Canada-Ukraine Foundation in which she fused her interactive lesson with 21st century technology to create “ one of the coolest, most immersive learning experiences we have been fortunate to share with our students.” Recently, she signed a memorandum of agreement with the Ministry of Education in Ukraine to help organize a course on teaching the Holodomor and other genocides for Ukraine. She is also the daughter of two survivors of the Holodomor. In May 2017, Kuryliw organized the second national Holodomor Education Conference: Education–Awareness–Action, at the Canadian Museum for Human Rights (Winnipeg, MB) which was co-sponsored by the UCC National Holodomor Education Committee. Kuryliw received the Queen Elizabeth II Diamond Jubilee Award in 2013 for her input in the development of Canada, the Shevchenko Award for Education from the Ukrainian Canadian Congress (2013), and in 2015 was selected as one of 150 Canadians who exemplify Canadian values by the Canadian Race Relations Foundation for the 150th Anniversary of Canada. Kuryliw continues to conduct workshops, give presentations and serves as consultant to various educational projects in Canada and Ukraine, often making guest appearances in educational institutions.